A lot of planning goes into developing an ad for a product. Use the organizer to explain your plan for an ad. 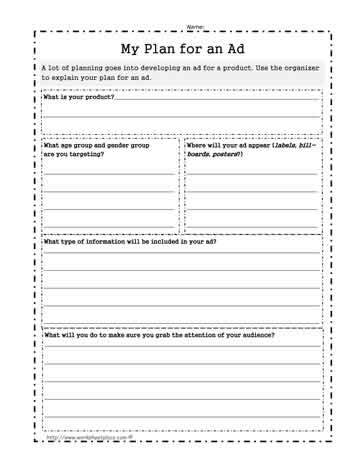 In this graphic organizer, determine what your product or service is, decide where your ad appear (labels, billboards, posters?) Determine what kind of information will go on to your ad and convey who your audience is. Remember, business pays a lot of money for ad campaigns.